In May this year, you will be able to cast your vote in the European Parliament elections. We invite you to vote - because we believe that you should have a voice in how the European Union will be shaped for future generations. We invite you to vote as the European Union is far from perfect – there is a great deal of work to do. We invite you to vote as Europe needs reforms that put people and our planet first. We believe in an ever more democratic, open and inclusive Europe, based on fundamental principles as solidarity, equality and freedom. Voting alone will not bring this European Union into existence, but it is an starting point. Because with this elections we must defend the union against nationalism and hatred before it’s too late. But we are also aware that many people do not even know about the elections and the fact they have a right to vote. On this page we share with you our collection of information, campaigns, and stories that will give you a better idea of what these elections are actually about. Want to get in touch? Contact our Advocacy Team! For most people, this is a true hurdle. How and where can I vote? How does this work? Especially if you live in another country, information can be difficult to find. Luckily, there is a tool that will tell you exactly how! What is the European Parliament and how does it work? What are the political groups and what is a lead candidate? What have members of European Parliament voted for over the last years? Watch some clips that explain how it all works in just a matter of seconds! what does your vote do? Is the party you're thinking of voting for in bed with parties from other countries that are violating basic values? The #Vote4Values elections tracker will bring you the answers based on the latest polling data. 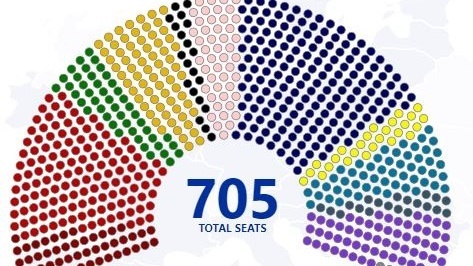 What is the actual composition of the European parliament and what do polls predict? Explain the Parliament to me! Take the handy quiz by yourvotematters.eu to find out what best matches your values and what is important to you. Vote on 25 real decisions that Members of the European Parliament have actually made in the last five years, and see at the end which politicians, national parties and European political groups match your views based on facts (rather than promises/manifestos). Elections are important. But our work for an open, democratic and inclusive Europe takes place before and after elections. We invite you to join us. We have opened a grants call to support your ideas, projects, and experiments that breathe new life into European democracy. If you are interested to read more in-depth opinion pieces on the state of Europe today and the elections, look no further. Eurozine has started a new focal point collecting articles that explore the difficult relationship between old and new EU nations, the centres and the peripheries, the government and the voter. Do you want to play an active role in these elections in your local community? Or on internet? There are numerous campaigns in the run up to the elections. Some focus on the elections in general, some draw attention to one issue. All of them share the idea #ThistimeImvoting. Populism is as old as democracy itself. The Guardian investigates the new rise of populism on the global stage in this sixth month series leading up to the 2019 EP Elections.